I love free software but I’m not a huge fan of all the junk that often gets bundled with programs -- toolbars and the like -- or the changes that the software sometimes wants or tries to make to my search provider. The order, as far as I’m concerned, should always go like this -- Google first, Bing second, Ask never. But so long as the extras are clearly labeled, can be deselected without problem, and easily uninstalled afterwards if I accidentally miss one, I don’t have a real issue with this bundling. It provides a way to get the software for free and funds future development. However, I’m a savvy computer user and as part of my job I install and uninstall a lot of free software, so I know what to look out for. For the less technically astute, it’s easy to get caught out and end up installing a lot of crap you don’t want. Which takes me to the point of this article -- Oracle and the Ask Toolbar. The only reason anyone uses Ask now is because a piece of software installed the search toolbar on their computers and they haven’t realized, or don’t know how to get rid of it. A lot of software comes with the Ask Toolbar bundled, but according to Soluto in a new blog post, 40 percent of all Ask installations come from a Java install or update. Soluto says Java is installed on 70 percent of all browsers and because the software is so notoriously insecure, critical security fixes come thick and fast. Every time it’s updated, users have to pay careful attention to make sure they don’t end up with the Ask Toolbar. Soluto claims 30 percent of all its users have had the toolbar installed on their computers at some point, and according to the company "The fact 59 percent of Soluto users choose to disable Ask.com toolbar for their customers shows how hated a piece of software this is. We believe most of the remaining 41 percent simply haven’t gotten to it yet". 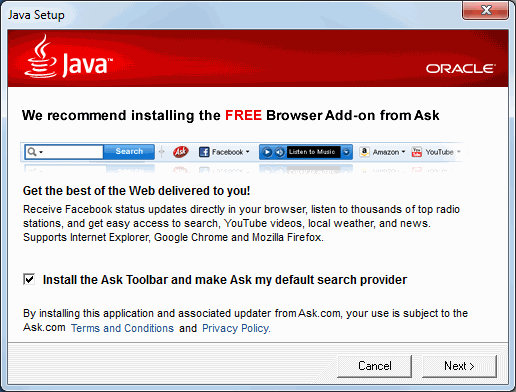 A survey asking Oracle to stop bundling the Ask Toolbar with the Java installer has to date garnered 16,702 signatures. Soluto's blog post is timely for me, as at the weekend I removed Ask Toolbar from my in-laws computers (it was on two of them) and both came from Java updates at some point in the past. I removed Java at the same time as the toolbar. The Ask addition is a nuisance. As Soluto explains "The toolbar takes over the browser’s default search provider and replaces it with the Ask.com search engine. Ask’s search is clearly inferior to Google’s search, giving users lower-grade search results and bombarding the user with banner ads, video ads, and in general a poor experience. It also tries to hijack the default homepage and depending on the browser -- it often succeeds". When you install or update Java, if you forget to untick the Ask Toolbar option you won't be able to uninstall it immediately because the crapware idles around for ten minutes or so, pretending not to exist before installing silently in the background. I think out of all the unwanted programs I’ve had to remove from friends and family’s PCs, it’s this which is now at the top of the list. Have you had similar problems with the Ask Toolbar, or is there a worse example you’ve found (Conduit, Babylon, etc.) feel free to vent about crapware in the comments below.